A Champagne sorbet for New Year's Eve? 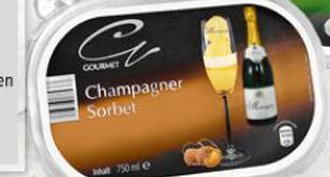 A German supermarket network sells a sorbet containing 12% of champagne under the name ‘Champagner Sorbet’ (Champagne sorbet in German). The Comité Interprofessionnel du Vin de Champagne (CIVC, Interprofessional Committee of the Champagne Wine), very active in the protection of the protected designation of origin (PDO) ‘Champagne’, took the view that the name ‘Champagner Sorbet’ was infringing the PDO Champagne and brought proceedings before the German courts. Do the regulations protecting PDOs also cover a case in which a PDO is used as part of the name of a foodstuff which does not correspond to the product specifications but to which an ingredient has been added which does correspond to the product specifications? Does the use of a PDO as part of the name of a foodstuff which does not correspond to the product specifications but to which an ingredient has been added which does correspond to the product specifications constitute exploitation of the reputation of the designation of origin where the name of the foodstuff corresponds to the name usually used by the relevant public to refer to that foodstuff and the ingredient has been added in a quantity which is sufficient to give the product one of its essential characteristics? Does the use of a PDO in the circumstances set out in Question 2 constitute unlawful misuse, imitation or evocation? Are PDOs protected only against false or misleading indications which, for the relevant public, are liable to convey a false impression as to a product’s geographical origin? Unsurprisingly, it was decided that the name ‘Champagner Sorbet’ constituted a commercial use of the PDO Champagne and that Community Law protecting PDOs was applicable. The Court indicated that the exploitation of the reputation of a PDO presupposes the use of this PDO in order to profit unduly from its reputation. The use of the name ‘Champagner Sorbet’ to refer to a sorbet containing champagne is likely to extend to that product the reputation of the PDO ‘Champagne’, which conveys an image of luxury and prestige, and therefore is likely to take advantage of that reputation. Where products protected as PDOs or Protected Geographical Indications (PGIs) are used as ingredients of foodstuffs that do not correspond to the products specifications, it must be considered that there is an exploitation of the reputation of said PDOs if those foodstuffs do not have, as one of their essential characteristics, a taste attributable primarily to the presence of those ingredients in the composition of the foodstuffs. In this case, the taste generated by the presence of Champagne in the sorbet is supposed to constitute one of the essential characteristics of the ‘Champagner Sorbet’. Does the use of the name Champagne sorbet constitute misuse, imitation or evocation? According to settled case-law, the Court recalled that the notion of ‘evocation’ covers, inter alia, a situation where the term used to designate a product incorporates part of a protected designation, so that when the consumer is confronted with the name of the product, the image triggered in his mind is that of the product whose designation is protected. That is not the case here, where direct use is made of the PDO to openly claim a gustatory quality connected with it. The Court ruled that if the sorbet did not have, as an essential characteristic, a taste primarily attributable to the presence of champagne in its composition, it could therefore be considered that the name ‘Champagner Sorbet’ would be a false or misleading indication. The Court provides interesting insight regarding the delicate balance between consumer information through product labelling and the misuse of PDOs to benefit from their reputation. Such limits to the protection of PDOs are in line with the Community case-law which authorized the use of a mark for descriptive purposes (C-2/00, 14 May 2002, HOLTERHOFF) or where the consumer does not perceive the sign as an indication of commercial origin (C-48/05, 25 January 2007, ADAM OPEL). Share the post "A Champagne sorbet for New Year’s Eve?"